A lot of budget belt sanders offer only a single speed, which makes them fine for the work of the occasional DIYer but virtually useless to dedicated hobbyists and professionals. Although the Tacklife PSFS1A Belt Sander sells for the price of the common budget belt sander, it boasts a number of features that are usually reserved for more expensive models, such as a 5-amp motor, a variable speed dial, and a lightweight design. 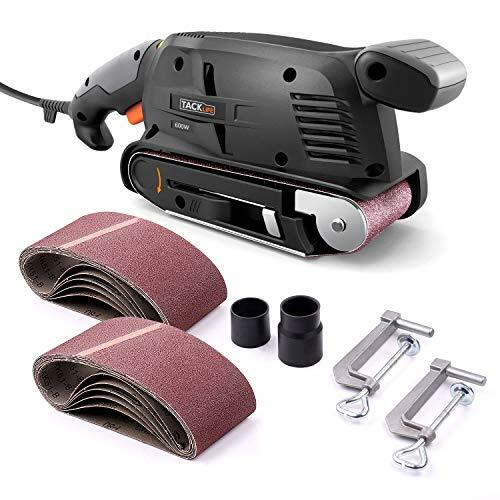 The immense popularity of this belt sander is made all the more impressive by the fact that it was only released by Tacklife in December of 2017. While professionals may benefit from purchasing the Tacklife PSFS1A Belt Sander as a secondary tool, it isn’t the first belt sander we would recommend to those hoping to make a living from carpentry. However, it should be high on the list of any experienced hobbyist who is ready to trade in their initial belt sander for a model that is going to take them to the next level and beyond. If you are a homeowner searching for a belt sander that you can use around the house, the Tacklife PSFS1A is not the belt sander for you as it will likely prove too complex for your skill level. A lot of manufacturers of budget belt sanders sell their products without any accessories or add-ons as a means of obtaining a lower price. Thankfully, that is not the case with Tacklife and its PSFS1A Belt Sander. Purchase this belt sander and you will also receive a metal screw clamp, a dust collection box, and a vacuum adapter. Also included with the PSFS1A Belt Sander are a comprehensive user manual and a two-year warranty to minimize the risk of malfunctions. One of the major selling points of this belt sander is its ability to reach multiple speeds at the turn of a dial. It boasts a total of six different speeds, making it ideal for small jobs at home and larger jobs in a workshop. The belt itself rotates at over 14 feet per second, which is almost unheard of in a budget belt sander. 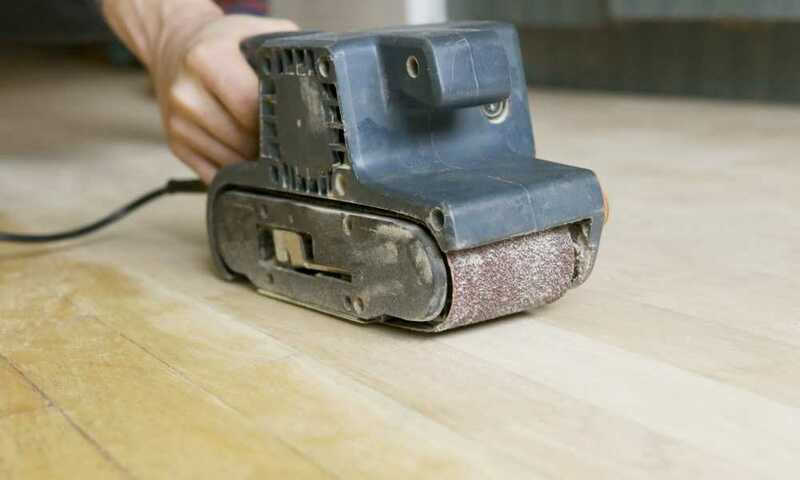 Tacklife fitted this tool with a lock-in switch, which makes for a less stressful sanding experience by allowing you to keep the device in motion without forcing you to continuously hold down the trigger. Although this is not a battery-powered model, it does come equipped with a power cord that is over nine feet in length, so you won’t have to worry about packing an extension lead when using it on a worksite. No matter how skilled you believe yourself to be in the art of belt sanding, it never hurts to brush up on your knowledge. For that reason, we advise you to watch the below video before purchasing the Tacklife PSFS1A Belt Sander. We mentioned already that the Tacklife PSFS1A would make a fine secondary belt sander for professionals, but what if you’re a tradesperson searching for a primary belt sander? If you are in such a position, we suggest you consider the 352VS Belt Sander from Porter-Cable. Designed for heavy-duty sanding jobs, the Porter-Cable 352VS is a variable speed belt sander with an 8-amp motor capable of reaching up to 1,300 SFPM. It features a quick-release belt-change lever, which allows you to make belt changes in seconds, leaving you with more time for your work, and a dust bag with the ability to swivel a full 360 degrees so you won’t have to worry about it getting in your way. While it will set you back a bit more than the Tacklife PSFS1A, the Porter-Cable 352VS Belt Sander boasts all-metal housing and a three-year limited warranty for added durability and peace of mind. We’ve reviewed a lot of belt sanders in our time and we really have to hand it to Tacklife for what it has achieved with this one. The Tacklife PSFS1A offers hobbyists a taste of professional belt sanders without the price tag, serving to prepare them for their eventual move up the woodworking ladder. Its 5-amp motor provides the perfect degree of power for tackling more complex projects and its versatility is only increased by its six different speeds and unusually wide range of included accessories.